« Boppard Roman Walls – plus dragon? Visiting the Musical Museum near Kew Bridge last week was huge fun and it’s something I thoroughly recommend. So what’s it about? 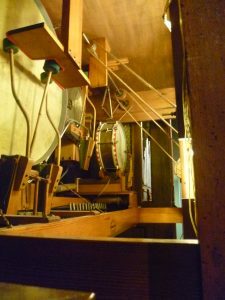 It comprises a large collection of 19th – early 20th century self-playing musical instruments and (and this is the fun bit) most of them still work. 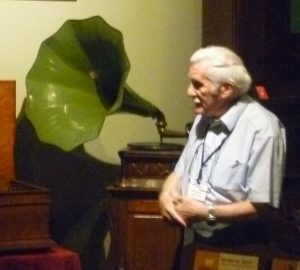 I went on a group tour, guided by the wonderful Roy Huddlestone – now eighty-six and looking twenty years younger – who not only knows the various instruments and their stories inside out but also demonstrates them, to thrilling effect. 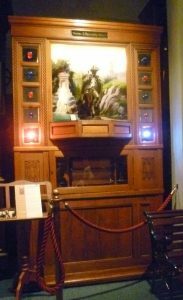 Until you’ve heard the Popper ‘Clarabella’ Orchestrion, which, in its 1910 heyday thrilled customers in a German Bier Garten, complete with flashing lights and lit up ornamental waterfall, not to mention a bronze statue of the Pied Piper, belting out popular tunes fortissimo with full orchestral piano, xylophone, Glockenspiel, drums, cymbals and triangle, you ain’t lived. Orchestrions are machines that are designed to play music that sounds like a full orchestra. They are operated by means of a pinned cylinder or, sometimes, by a waxed paper music roll. 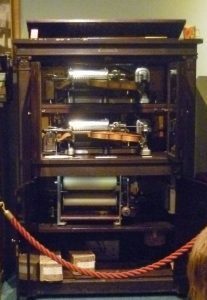 Originally, it was coin-operated – an earlier version of the juke box – and it’s powered by electricity. One of the most extraordinary instruments we saw was the Chicago-made Violano Virtuoso from 1921 which played two violins – you can see them above lying one above the other. They are strung with piano wires and the mechanism is operated by a large pinned cylinder, which you can see at the bottom. Notice the mug on top of the case. This is for the penny – it’s coin-operated – and Roy demonstrated how you put the penny in and, as he put it, ‘The penny dropped’ – the origin of the phrase. There are dozens of tunes to choose from, but the one we heard was ‘Kiss me Again’, popular at the time. Next to the Violano Virtuoso was a very early HMV gramophone with its wonderful green ear-trumpet. Naturally, it played an HMV 78 record with the familiar image of the inventor’s dog Nipper, sitting, ears pricked, listening to His Master’s Voice. The tune this time was The Old Bull and Bush and, if we were hazy about the song at the beginning, we certainly all knew it by the end. This post first World War piano orchestrion really took my fancy. I loved the beaded lampshades for the candles, they must have looked wonderful with the flickering candlelight shining through them. Not only does this instrument play the piano, it also plays the drum, xylophone and cymbals. 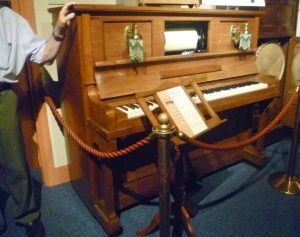 It originally stood in a Public House – you can see cigarette burns at the end of the key board. – and played popular tunes of the day. What I particularly liked was the fact that, although it worked by electricity, if there was a power cut you simply fixed a connecting hose to the nearest tap and, lo! it worked by water power! 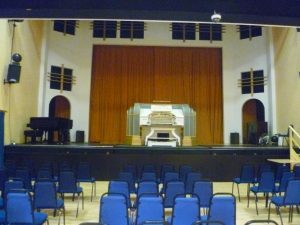 The Concert Hall with the mighty Wurlitzer. Finally, and I’ve looked at only a selection of the self-playing musical instruments we heard, we were treated to a mini concert by the museum’s resident organist, Chris Barber, on the splendid Wurlitzer Theatre Organ which came from the Regal cinema in Kingston-upon-Thames and dates back to 1932. The museum holds tea dances here and the floor is specially sprung for dancing. And while the Wurlitzer plays, its Art Deco light panels change from red to cyclamen pink, to blue, to green and back to red. First, Chris played his smooth medley of Spanish-themed music and then demonstrated what else the Wurlitzer could do. He played the very deepest note which sounded like a whale humming – you could hear it through your bones – and followed that by the very highest note, which was almost inaudible, except, possibly, to bats. 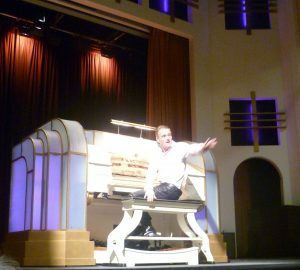 The Wurlitzer was originally invented to accompany silent films, so he demonstrated the organ playing a Keystone cops accompaniment, with whistles, bangs and tyres screeching. Then he launched into church organ mode with a Bach chorale, before switching to background music for ‘the tension rises’ scene in a silent film. The Wurlitzer can also do brass instruments, and strings. In fact, it can do most things. It was a great way to end the visit and I enjoyed it all tremendously. How fascinating! Reading about these ingenious inventions stirred a kind of wistfulness in me for simpler times when people gathered together to be entertained and astonished and diverted. Wouldn’t it be strange to allow a group of them to travel forward to the 21st century where we can sit in our own homes, in our own individual rooms, watching just about anything that’s ever been filmed or heard, on our own personal screens Would they wonder whether, as well as benefitting from so much, we’ve also lost our sense of communal wonder? I think you’re right, Prem. One of the things I enjoyed most was just that, ‘communal wonder’. The entire group, I’m sure, felt the same – we even sang along to ‘The Lambeth Walk’ and ‘The Old Bull and Bush’ in an completely unself-conscious way. Envy you that trip, Elizabeth. I love old instruments like that. I just think they are so cleverly designed, and your Chris Barber sounds a very virtuoso. Fab post. THank you, Elizabeth. I agree with you – a huge amount of ingenuity obviously went into creating the automata bits which struck triangles, plucked violin strings and banged drums, etc. Chris Barber, the ‘Mr Romance’ of the theatre organ, was indeed a virtuoso. Apologies for posting this here but I was unable to elsewhere. Your post on “A Child’s Day through the Ages by Dorothy Margaret Stuart” is all I could find that might have a description as to what wool garland may look like. Was there a description in the book? I’ve emailed you about this, Shane. Thank you for your question.